Touching and emotive, this is a heart-melting tale of reflection, introspection and moving on that draws attention to the delicate threads of love holding families together. Endearingly illustrated by Suwannakit, this story embraces family relationships, most notably those between a young girl and her grandparents. One grandparent dies; the other lives on and a young girl struggles to make sense of the loss. She is unable to forget about her grandma and ‘keeps finding things…to show Grandma’. Sepia coloured illustrations contrast the girl’s before and after with tender detail, recreating special generational moments that will strike a familiar chord with many readers. 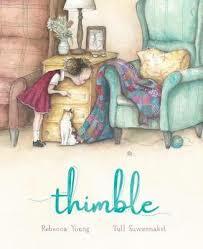 In a slowly changing climate of strangled mind-sets, it is warming to see more and more picture books addressing the everyday issues of loss and grief as Thimble does. Gorgeous, retro-styled artwork that uses a vivid yet limited palette, illustrates the tender, love-filled relationship between a young girl and her ailing grandfather. Together they experience the changing seasons, admiring each of its beauties and sharing each other’s company with contemplative ease. This poignant story promotes imagination and creativity as a way of harbouring precious memories whilst simultaneously moving on with life. Coelho’s poetic prose addresses death and the cycles of life in an open, honest and supremely beautiful way. This is a truly exquisite book. Share it with grandparents, carers and the little people who bind them together. For a little more levity, try this paperback release. When Fred and Nell’s parents temporarily skip town leaving them in the hands of Grandma, nothing seems out of the ordinary – at first. Grandma runs a tight ship with high expectations, exactly the type of uncompromising rule a few dozen Martians are determined to duplicate. After a dastardly devilish duplication plan is devised, the kids on Earth begin to suspect the worst and respond with a counterplot to beat the invaders at their own game. 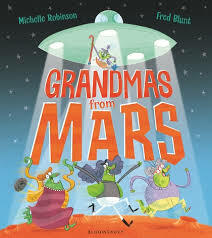 Robinson’s jolly rhyming verse coupled with Blunt’s ribald illustrations paints a comical appreciation of all things granny that will generate more than a chuckle or two in 3 – 5-year-olds. The moment the glorious end pages of this book, melting with blended colour, greet you, you know you are part of something special. Finding Granny is a story that champions the robust and wily nature of Edie’s granny. Granny is a chameleon of personalities and skills much like many other grandparents. She is playful and inventive, gutsy and wise, loving and above all, always there. Except one day when she is not. After suffering a stroke, Granny takes time to heal and recover her old self. Edie becomes recalcitrant, unable to accept this colossal change in someone she thought she could always rely on. Simpson’s informative yet gentle narrative helps readers experience not only Granny’s situation but also Edie’s gradual acceptance of her illness. 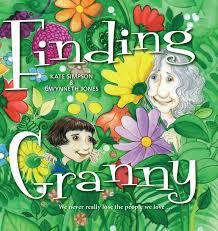 With a bit of time and patience, Edie is able to ‘find’ the Granny she knows and loves. Jones’ illustrations paint a cosy picture of Edie and Granny’s relationship linking past and present and playfully reassuring readers that Granny is still the Granny she always was. Finding Granny is a judiciously presented picture book that broaches the subjects of illness and disability in an open, sensitive and creative way that 4 – 8-year-olds will find appealing and easy to accept. Another picture book from the EK stable of ‘stories with heart’ is this valiant portrayal of a young girl’s attempt to understand her beloved grandpa better. She discovers the source of her grandfather’s sadness stems from his involvement in the Vietnam War, and through their shared memories and pain, develops a deepening sense of pride and understanding towards him. 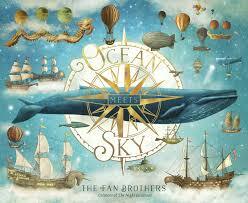 Cooper’s illustrations are heartfelt and all encompassing. They effortlessly depict the close relationship between the small girl and her grandfather with graceful irony and absorbing detail, whilst simultaneously softening and pinpointing the immensity of the subject matter. This is a story of considerable magnitude yet Harper manages to relay it to young readers in a way that pays appreciable regard to the condition of PTSD and homage to the 50th Anniversary of one of the Vietnam War’s longest battles, Khe Sanh. 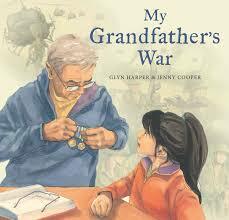 My Grandfather’s War is a timely book that introduces primary aged readers to the impacts of an inglorious war and its ‘lingering effects’ on the people they love. It provides a useful conduit to a past they may only have ever seen reflected in the eyes of their grandparents and thus prompts discussion and understanding; something Harper is keen to encourage in order to get kids ‘hooked on history’. 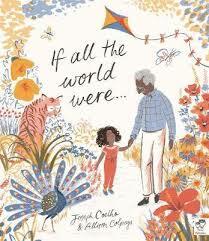 You’ll find a few more beautiful books about the special relationship between children and their grandparents here, in Romi’s round up of ‘marvellous’ picture books. These are beautiful. Thank you for sharing them. Next Next post: Excellently Exciting New 2018 YA Releases!